The Santa Rally got off to a good start last week when the S&P 500 rose 0.9% to reach its 52nd record close of the year. The Dow Jones Industrial Average jumped 1.4% to cap off a 1,000 point rally in the past ten days. Even small caps joined the party. 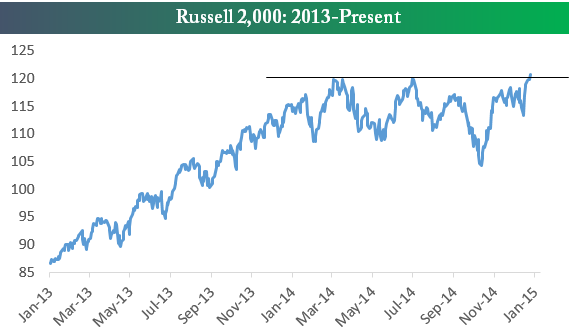 The Russell 2000 Index climbed 1.9% for the week, and importantly, pushed above the 1,210 mark. This index has been consolidating for most of the year, failing to break out above this threshold in March and July. Continued holding this level over the next few trading sessions could signal a breakout for small cap stocks. Early last week, the Commerce Department released its third revision of 3Q14 GDP growth showing the U.S. economy expanded at a 5% seasonally adjusted rate. 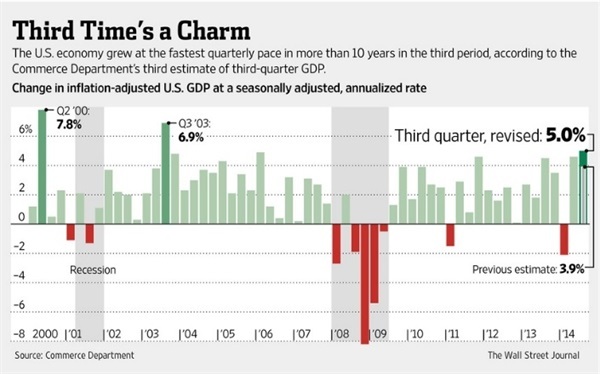 This is the strongest pace in more than a decade. All major segments were revised up, with the most impressive being the consumer, up 3.2%. This initial reading was just 1.8%. Importantly, most of the consumer gains occurred before the rapid decline in gasoline prices, which have fallen for nearly 90 consecutive days to a nationwide average of $2.40. This, coupled with improving jobs data, could push 4Q14 consumer growth above 4%, enough to offset weakening exports and lower military expenditures and keep annualized GDP growth for the quarter around 3%. The one area of the domestic economy that continues flagging is residential real estate. Last week, weaker than expected housing starts in November were reported and this week brought disappointing metrics for sales of new and existing homes. Sales of previously-owned homes dipped more than 6% month-to-month according to the National Association of Realtors. This was well below expectations of just a 1% decline. 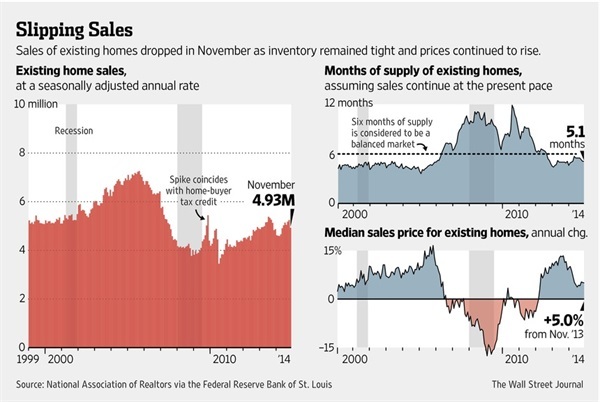 And sales of new single-family homes dropped 1.6% to a seasonally-adjusted rate of 438,000. The Bloomberg consensus estimate was 458,000. 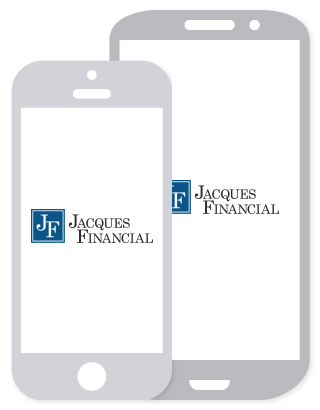 2014 was a banner year for IPOs. In total, 275 companies went public on U.S. exchanges, raising more than $85 billion. This is the biggest number of new companies and dollars raised since 2000. A big chunk of this came from Alibaba, who became the biggest IPO ever in September when it raised $25 billion, and the records continued. The U.S. wasn’t alone. Worldwide, more than 1,200 IPOs raised $285 billion globally in 2014, according to Dealogic. 2015 seems off to a similar start. So far, more than 100 domestic companies are in the pipeline for 2015 seeking more than $19 billion of funds. Interestingly, 2014 was also a banner year for Mergers and Acquisitions (M&A), where the total value of U.S. deals was $1.5 trillion, matching a high reached in 2007. Wearable technology hit mainstream a few years ago when Google Glass debuted. This product has since retreated from headlines, and the “wearables” torch has passed to activity trackers like Fitbit. Even the highly anticipated smart watches are expected to have a heavy emphasis on fitness and health. Leave it to two teenagers to break this trend and create some wearable technology for couch potatoes. Ryan Oliver (age 15) and Jonathan Kingsley (14) recently created KipstR, a 3D-printed wristband that detects when the wearer falls asleep while watching television and automatically begins recording the rest of the program. The bracelet uses a pulse oximeter to determine when the user dozes off, and then mimics a remote to pause and record content. The pair teamed up with Virgin Media, who hopes the technology can be used in the future to gauge emotional response to programming in order to suggest similar programming.